WINNIPEG — The Lutheran Women’s Missionary League–Canada (LWMLC) has developed a strategy with the potential to streamline operations at the zone level so the organization can better focus on mission goals and involve more women. Currently, many LWMLC members serve in leadership positions on several levels, and the LWMLC zones, the second smallest unit of the organization, struggle to maintain leaders, purpose and communication. Under proposed changes, societies in a zone may replace officers with a planning committee made up of representatives from those societies. The committee would replace the current twice-a-year “rallies or renewals” which presently include business meetings, with programs and events relating to the daily lives and spiritual growth of the women in LCC congregations in the zone. “Fewer officers in the overall structure…will allow better stewardship of time and talents, less confusion of responsibilities and improve communication,” said Judy Grande, president of LWMLC, in a news release. 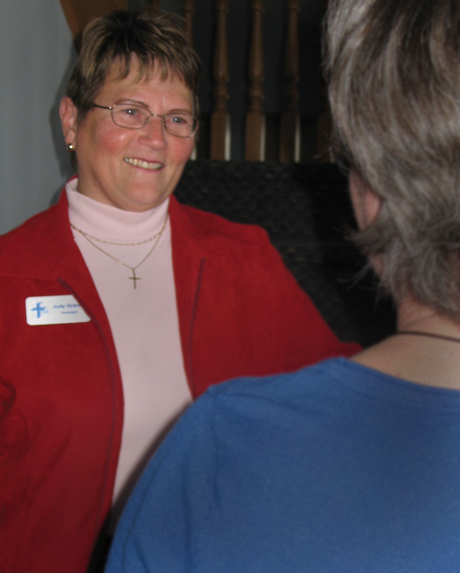 Running half-day or full-day events with inspirational talks, digging into the Word and carrying out mission and service activities will allow more Lutheran Church–Canada (LCC) women to be partners with women of LWMLC in their activities, she added. “According to a recent League survey, women of LCC are eager and willing to participate in Christian growth and service activities, but are generally not interested in business meetings and planning,” said Judy. The LWMLC is an auxiliary of LCC and has 3,000 members in societies in 230 congregations. While the two smallest LWMLC District’s have adopted the proposal, the final decision of adoption is left to each zone and district. LWMLC’s mission is to equip, motivate and encourage women to grow in God’s Word, serve God’s people and share God’s Son.